Several people in the central province of Nghe An have recently been earning large incomes from the sales of fighting buffaloes. The trade is quite new to Nghi Thai Commune, Nghi Loc District, and has sprung up after two consecutive, annual buffalo fighting festivals, which turned out to be quite successful. Last year 20,000 people attended. Doan Ngoc Hoi, a veteran trader from Nghi Thai, estimated that around 20 fighting buffaloes have been brought to the commune this year, despite the festival being held earlier. He also pointed out some of the criteria involved in the selection of a buffalo suited to fighting, including the shape of the horns. Small, black eyes, thick eyelids, wide necks are also appreciated by aficionados. He paid VND62 million (USD2,970) in the Mekong Delta for the animal, who has already won two competitions. Vuong Dinh Khuong, is another buffalo expert located in Thai Tho Commune. His buffalo won second place at the festival in 2011 and he has hopes taking first prize this year. After looking at hundreds of animals, he finally decided on one, for which he paid VND60 million (USD2,874). 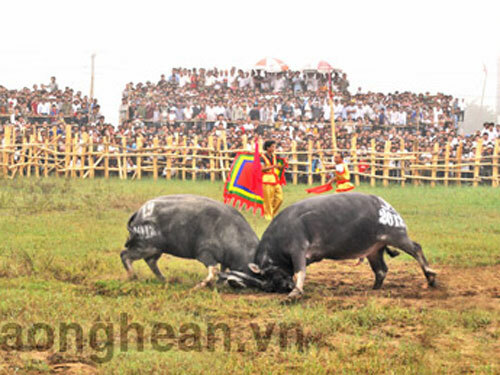 Phan Huu Loc, of the Nghe An provincial Department of Culture, Sports and Tourism said that communal and district governmental bodies have sought official recognition of the festival, but since the event is fairly new to the region and there are only a limited number of buffalo trainers in Nghi Thai, issues such as safety have prevented these requests. “We can’t recognise this event at an official level unless some of the outstanding issues are dealt with,” he said.